The Dec 2016/Jan 2017 issue of inPAINT magazine will feature its first-ever product guide. 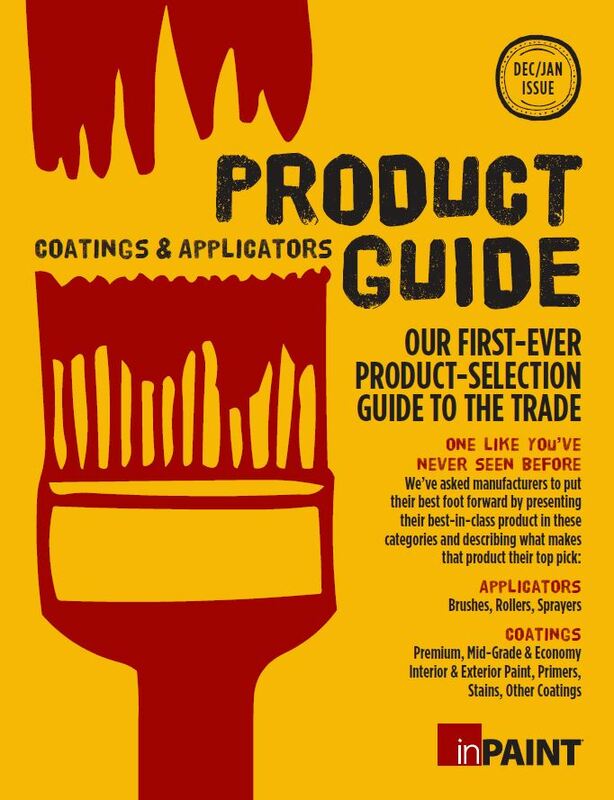 Unlike other product and resource guides that are organized by manufacturer, the inPAINT Product Guide is organized by product type, making it easier to do apples-to-apples comparisons amongst the categories: coatings and applicators. The coatings section features 14 types of products, including different grades of interior and exterior paints, primers, stains, coatings for metal, concrete & masonry, porch & floor, stucco, and specialty. In addition, per-gallon costs are listed for all interior and exterior paints. The applicators section features nine types of brushes, five roller types, and four types of sprayers. Many of the major coatings manufacturers and biggest players in the applicator fields are represented. A second product guide focusing on products related to prep, pressure washers, vehicles, ladders, lifts, removal systems, and accessories is slated for early 2017.